Almost the top PlayStation console. Half the hard drive memory, the rest is similar. Sony PlayStattion PS3 includes IBM CPU and Nvidia graphics accelerator. In average PS3 system is considered to be 40 times faster than the PS2 system. The console has very high quality video and audio systems. Video is connected through HDMI, that allows 128-bit full HD format output with 1080p resolution. The console also supports Dolby Digital 5.1, DTS 5.1, and Linear PCM 7.1. Just like the ability to play DVD’s made the PS2 stand out from the pack, the huge amount of multi-media features turn the PS3 Slim into a flexible entertainment system. Lighter by 36 percent, smaller by 32 percent, and eating up 34% less energy than the previous versions, this latest version of the PS3 has been completely altered for a slicker look and feel. With features that include Internet access, video chat, audio and video playback capability, and the ability to view digital photos, the PS3 Slim is sure to become one of your most crucial media-viewing systems. However, before everything else, the PS3 Slim is a powerful video game system. The PlayStation-3 Slim comes equipped with the Nvidia graphics processor and IBM’s cell processor, giving the system the capability to perform over 2 trillion calculations every single second. This results in the PS3 Slim being nearly 40 times faster than its predecessor, the PS2. The PS3 Slim is an integrated with a high definition multimedia interface (HDMI) port, which gives the system the ability to deliver unconverted, uncompressed, high quality sound and digital picture via compatible high-definition projectors and TV’s. The PS3 Slim has a 1080p resolution compatibility, as well as 128-bit pixel precision, resulting in a nearly complete HD experience. 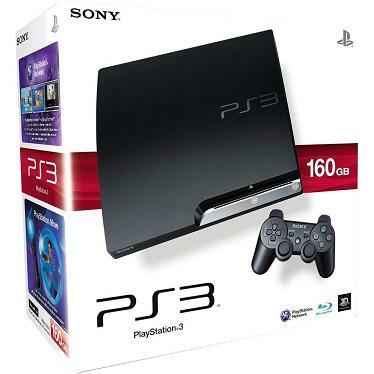 The PS3 Slim supports Dolby Digital 5.1 surround sound and has a 160 gigabyte internal hard drive, providing you with plenty of storage space for saving games and downloading stuff from the web. The games that are developed for the PS3 Slim are made in the Blue-Ray format, and are capable of holding 6 times the data of regular DVD’s. This increase in storage capacity, coupled with the incredible power of the graphics card and processor, results in a new generation of games that deliver a gaming experience never before seen. Also supported by the PS3 Slim are CD-RW’s, CD-ROM’s, DVD’s, DVD+R’s, DVD-R’s, and DVD-ROM’s. Additionally, all software updates for the PS3 that include 2.20 and higher come with BD live support. This feature allows you to play BD-LIVE supported disks and connect to the net when playing disks that can support this particular format so that you can receive additional features. These features vary depending on the software being used. People that are new to gaming move the controller by instinct while playing, despite the fact that such movements do not effect the game in any way. Sony was inspired by this tendency and proceeded to implement it into the controllers for the PS3 Slim. The new PS3 Slim controllers have motion detectors built in, allow you to control the game’s action by simply moving your hands while holding the controller. An example would be moving your hands side to side to steer the wheel of a car in a racing game. Although the PlayStation-3 Slim controller strongly resembles the PlayStation-2’s dual-shock controller, it comes without the vibrating function, as it has proven to interfere with blue-tooth signals, which is the wireless technology that PS3 Slim controllers are based on. If your controller’s battery is low, you can connect it to a USB cable to recharge and continue playing while it’s recharging.